Usman is concerned about his son's education. The 30-year-old engineer recently returned to Turkmenistan to work in the gas industry after studying and working in Europe. But now he is considering leaving again, because his son has started returning from school chanting slogans praising President Saparmyrat Niyazov. "What has disturbed me is that Maksat is basically being brainwashed. All he learns is passages from the 'Ruhnama' [Niyavoz's book that has become the principal text in Turkmen schools] and has started telling me off because he has memorised more of the book than me," he told IRIN in the capital, Ashgabat. There's growing international concern and internal resentment over what many observers see as the government's hijacking of education in Turkmenistan. "There are two massive issues in the primary [education] sector currently: the promotion of Niyazov's personality cult and the downgrading of subjects that encourage independent thought or knowledge of the outside world," a foreign diplomat in Ashgabat told IRIN. Although the government is quick to dismiss criticism of the education sector as Western or opposition propaganda, more and more evidence is emerging of deteriorating conditions and plummeting standards in a nation well endowed with oil and gas. "Most rural schools have no facilities, no proper textbooks, teachers who want out and children absent picking cotton for months at a time," a former teacher in the country's second city, Turkmenabad, told IRIN. Things were not always like this. Turkmenistan inherited a relatively comprehensive education system from the Soviet era featuring free and near-universal access for both sexes. National literacy rates were correspondingly high. But the system went into decline in the 1990s as the economy faltered and the government's "Turkmenistan" programme took effect. [Turkmenistan] Ruhnama is now compulsary in Turkmen schools. "Changing all the schools books from Cyrillic to Latin [scripts] in the mid-nineties was really the start of the problems," the former teacher said. Now Russian textbooks have been banned from Turkmen schools, and in the absence of any vernacular school books replacing them, there is a severe shortage of teaching material in most schools. Moreover, it is not just Russian that is under attack; the British Council has been negotiating with Turkmen authorities for more than two years to get an English language study skills textbook published and distributed to schools. "It has not been easy. We've had to make quite a few compromises on content," said Martin Seviour, the deputy director of the British Council in Uzbekistan. There is still no firm date for publication of the textbook from Ashgabat. Other observers see official reluctance to put resources into English as part of a plan to keep Turkmens isolated from the outside world. "People are crying out for English as it's sometimes a passport to better things, but the government is not encouraging it," one foreign diplomat said. The government's response to lack of school books has been to make teaching from the "Ruhnama", which Niyazov wants elevated to the level of the Koran in this nominally Muslim country, compulsory in primary and secondary schools, particularly in rural areas where most Turkmen's live. "Now it's history taught from the 'Ruhnama', geography taught from the 'Ruhnama', even English taught from the 'Ruhnama'," Michael Clarke, a Peace Corps volunteer who had worked in a rural Turkmen school, told IRIN. Although the "Ruhnama" states: "Each citizen has the right to education and everyone shall have the right to obtain this for free", the reality is very different, analysts say. "The education crisis in Turkmenistan has reached devastating proportions. By reducing the amount of time students spend inside the classroom and degrading the quality of the education they receive, the Turkmen government is precipitating a tremendous crisis in literacy," Erika Dailey of the Open Society Institute's Turkmenistan Project told IRIN from the Romanian capital, Bucharest. Last year, the government took the decision to shorten mandatory primary and secondary education from 10 to nine years; 12 is the norm in Europe and the US. "So now my daughter sits at home for a year instead of studying, that's no start in life for her," one disgruntled parent of a victim of the new education system told IRIN. At a higher level there has also been a drastic cut - from five to two years of study and two years of voluntary or paid work before a degree is conferred. About 12,000 teachers across the nation of 5 million people were dismissed two years ago. The Academy of Sciences was abolished and several research institutes were shut. Universities accept only about 3,000 students a year, a 10th of the number before independence. And bribes often determine who gets in, says a recent report from the International Crisis Group, a think-tank based in Brussels. 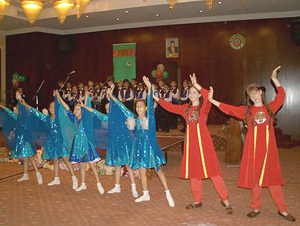 [Turkmenistan] Singing the praises of President Niyazov - a key activity in Turkmen schools. Dailey pointed out that the generation of Soviet-era students in Turkmenistan eligible for foreign scholarships was dying out, only to be replaced with young people with educational levels far below international standards. "Already there's an impact. In the last couple of years, for example, international scholarship programmes, even those giving an emphasis to Turkmen students, are having big problems finding any qualified Turkmen students at all." In a young nation like Turkmenistan where 40 percent of the population is under 14, the consequences for development of the setbacks in education could have an impact for decades. "There's no future for most of these kids; they have been let down badly by the education system, so drug and alcohol abuse and things like prostitution are the consequence," Clarke said. Others see a poor, uneducated population denied opportunities as fertile ground for the kind of religious extremism that did so well in neighbouring Afghanistan. Meanwhile, Usman and other concerned parents have got together and formed an underground school that offers mainstream subjects, including English, to 12 students. "There was no problem finding good teachers - so many are without jobs," he said. "Something is very wrong when we are forced to do this."